When a worker enters a new client into Penelope using the Intake Wizard, they create a CASE FILE for the client. The CASE FILE is identified by the client’s last name. Ex. Client is 123456, CASE FILE name is 456 Case. The CASE FILE acts like a folder that holds individual client information and service file information. Adding a CASE FILE for a client also creates an INDIVIDUAL PROFILE for them. 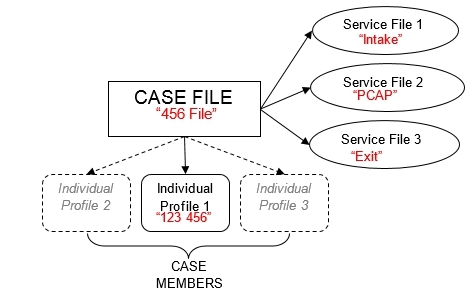 Numerous INDIVIDUAL PROFILES or “CASE MEMBERS” can be added to a CASE FILE if multiple members of the same family receive services from that agency. For our purposes, CASES will have only one (primary) CASE MEMBER – the PCAP woman. Each CASE FILE should also have at least one SERVICE FILE. The SERVICE FILE stores information like about the particular service. We create SERVICE FILES for the Intake, PCAP (progress), and Exit of a client. These SERVICE FILES can be linked to a “Primary Worker” and will hold the documents pertaining to each of these stages. This entry was posted in General and tagged case, case file, case member, individual profile, service file on May 17, 2013 by kbonot.